PLEASE NOTE: The ST6500 and ST6560 have been discontinued and are only available as refurbished models based on availability. The replacement product for the ST6500 is the AG6601 Series of Thin Client Terminals and for the ST6560 Wireless Thin Client Terminal, the AG6661 Series of Wireless Thin Client Terminals. Please click here for the AG6601 page and click here for the AG6661 wireless model.. The ST6500 - A Flexible, DUAL Video ready, high performance terminal that can be configured with Microsoft Windows Embedded Standard (WES) operating system, Microsoft CE.NET 6, or Linux. You can see the features provided by each of the Operating System choices in the Software Specifications below. CLI SNMP Administrator Management software is included with every unit. Rapidly deploy, configure, provision and maintain all models of CLI thin clients, wired or wireless. User productivity is enhanced by eliminating any learning curve and costs associated with PC products. Centralized management of individual units better utilizes support and help desk assets. Eliminates 5x94 remote controllers by using an inexpensive network router. You can also eliminate your SNA WAN and use TCP/IP thereby reducing communication costs. Plus, no per seat license cost. 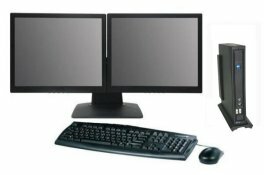 As with all of CLI's Thin client Terminals and Modular Twinax Display Stations, you select from a wide array of keyboard and monitor styles for individual application or user requirements. Whether you need a compact terminal with a 9" monitor and compact keyboard, or a large screen LCD model, CLI can provide the proper terminal for your particular requirement.